Buying a car isn't easy. It's a hassle to spend hours upon hours searching massive lots, and it's time-consuming to pore over pages upon pages of reviews. And, after finally deciding which of the dozens of cars to buy, it's especially hard to pay for one. Now, imagine doing all of that in virtual reality—minus the paying part. Online used car seller Vroom debuted a virtual reality showroom that lets users explore the 15 makes and models available with the comfort of their own headset. The experience, created in partnership with Dallas agency 900lbs of Creative, allows users to get as close as possible, digitally speaking, to their next set of wheels via HTC Vive headsets. (The launch also coincides with a TV ad campaign featuring Rachel Dratch and John Leguizamo that launched in July.) The experience will be available first in pop-up locations in Phoenix along with Vroom's showrooms in Dallas and Houston. According to Vroom's chief marketing officer, Gaurav Misra, the goal is to give consumers added insight to help them feel more confident when buying a high-ticket item online. That's not to say people aren't buying them from Vroom already: The company began a little more than two years ago and sells thousands of cars a month. Its total monthly revenue is around $100 million, Misra said, which puts the company on track to cross the $1 billion mark this year. "So many pieces are so endemic of how car buying has been at so many elements that when you show the counter of that, there's a little bit of disbelief," Misra told Adweek. "And so we have to work harder at making people understand and explaining why this makes sense to us." So how does this all work? During a virtual test drive in New York last month, Adweek explored the VR showroom before taking one of the cars for a spin. Picture a vast warehouse or garage—the kind you might find in "The Fast and the Furious"—filled with cars ranging from $25,000 to $60,000. 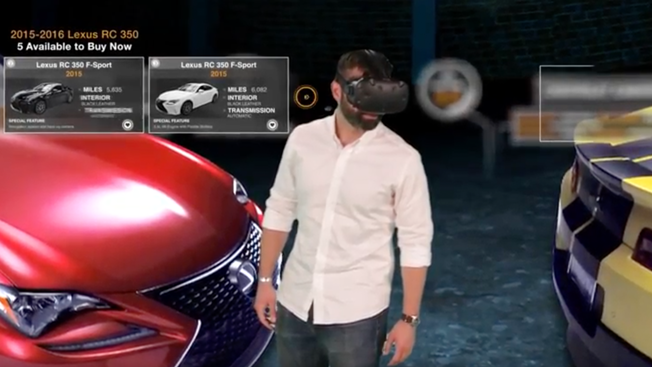 By aiming the headset at various parts of the room, you can get closer to any given model or stare directly at a car to get more information about it. You can then also take a test drive to feel what it's like to ride in the car while cruising along with a 360-degree video of a street in Texas. The cars are animated, which makes the experience more like a video game than an actual drive to work. It's also obviously impossible to feel what it's like to sit in the car, which could be a deal-breaker for more tactile buyers. However, there's already a second phase in development that makes the experience feel more like a real lot. That's partially why Vroom offers buyers a free one-week trial, during which they can get a car delivered to their home to drive around for seven days and then return if they're not happy. Misra said the experience is meant to get consumers excited about the Vroom brand and the cars it sells. And while there's a long way to go, he said, it's a way of "putting our flag on the moon." "The same way Apple has stores, we think it's a great way to get awareness and to get people familiar with the brand, and then hopefully, of course, that translates into an ROI," Misra said. "We want to develop it into a place. I don't know what that time is—six or 12 months—where people are actually transacting. They're searching for cars in this experience."